I cannot believe that it is October 6th already! I feel like we were just wrapping up summer and now we are in fall. I love all of the seasons and we try to get in the spirit of each one. Last night we went to The Corn Maze in The Plains. It was our first time but I remember driving by it last year. It was so much fun! We arrived around 6pm just before the sun started to really go down. You can do the maze in the dark with flashlights, but we knew that would be too challenging with our 6 year old. The woman working at the ticket booth told us that the maze usually takes between 30-60 minutes. They have flags to take with you in case you get lost and need someone to help you out. We took one just in case. (Thank goodness we didn’t need to use it!) They have little wooden placards that you rub a crayon on paper over to reveal the map of the corn maze. They also have trivia that give directional clues. We wore sneakers, which came in handy, because the corn maze is a little muddy. Colette did great! We finished in around 30 minutes or so. It was perfect timing for the walk back to their barn because it was starting to get dark. They had tons of play activities for kids: slides, giant spider web, animals, a pretend cow you can practice “Milking”. They also had a food truck with barbecue, apple cider donuts, kettle corn and drinks. They sell a huge variety of pumpkins also! It is such a beautiful display! This was the perfect kickoff for our fall! It's funny that when you start to list all of the things you are thankful for you are overwhelmed with gratitude! We came to the last week so fast! There were a few things that I knew I really wanted to do before it was over. A friend of mine, Jamilah, shared photos of the most beautiful lake in Pennsylvania. On Monday, my Mom, Colette and I packed up all of our swimming belongings and headed to Cowan's Gap. My Mom made an incredible picnic of ham & cheese sandwiches, pb&js, turkey and lettuce sandwiches, fresh raspberries from her garden, homemade pickles, root-beer, chips and some homemade chocolate chip cookies. Colette had a summer "bucket list" item since the beginning of the summer. She wanted a giant unicorn float that "was closed in the middle." She wanted to be able to use it at my parents pond without getting wet. We found one on sale a couple of weeks ago and we surprised her with it. She's been dying to use it ever since. We drove through the beautiful Pennsylvania countryside, passing by farms, flowers, cows, horses and barns. It was a gray, cloudy and chilly day. We didn't mind. We were on a mission to go to Cowan's Gap to go swimming. When we made it to the lake there were only a few other brave ones there. It was 68' outside. I found an outside plug to plug in the air blower for the giant unicorn. Seeing Colette's face when I brought it to the beach was everything! We spent the day swimming in the freezing cold water, lounging on the beach, eating and chatting. Colette made a little friend, named Cole, and the two of them had the best day playing on that unicorn. The sun came out and warmed everyone up. I can't wait to go back to go camping soon! The park was so clean, peaceful and private. 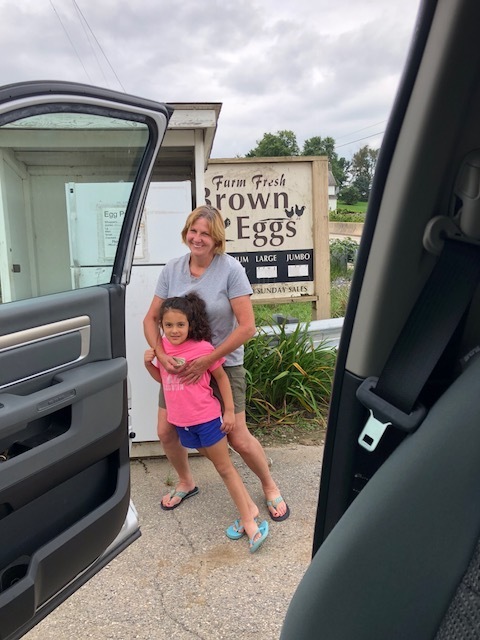 On the way home we stopped for fresh eggs from a farm. We placed our dollar in their "honor policy" container and took our beautiful eggs home with us. What a perfect way to end our summer! 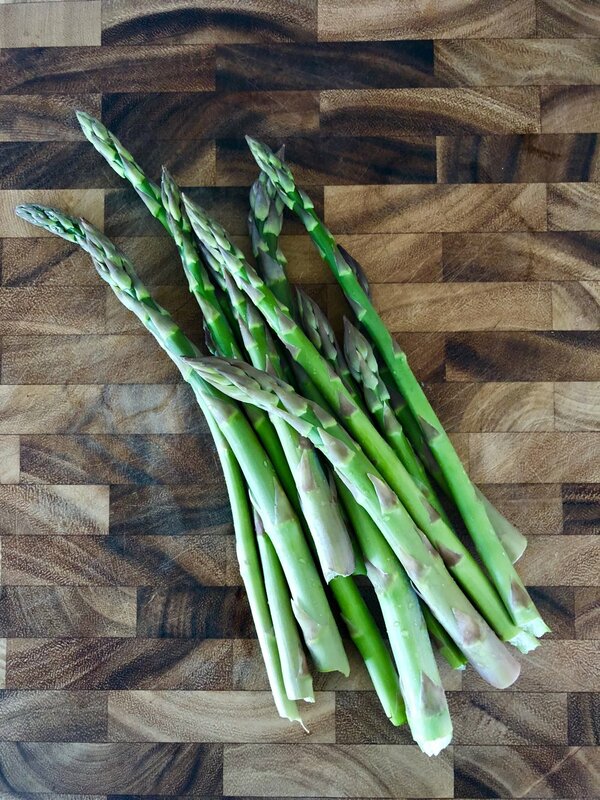 Our asparagus is coming up daily and we are enjoying having such a delicious treat from our garden. I put together a super yummy salad tonight and wanted to share. We have been enjoying the beautiful weather we've been having. Colette and I had dinner outside on our patio. I say it every year, but I love when all of the trees finally get their leaves! It is just so beautiful in Virginia right now. Everything is so fresh and lush. The groundhog just made his first appearance in our yard (No!). So that means I need to start planning my fence around my garden. Last year was such a battle. For tonight's salad I used some of our leftover corn on the cob we had in the refrigerator. The combination of the sweet corn and asparagus, crisp cucumber and lettuce, smooth goat cheese and tangy salad dressing was divine! I love the look of fancy chandeliers and the sparkle they put out when the light passes through them. They can update your home's style and they aren't permanent- so if you are ready for a change I recommend taking a closer look at your lighting. My parents have been very busy for the past year. They have poured their hearts and souls into their new, old home. Congratulations Mom and Dad!! You are an inspiration to many!! You are our world and we could not love you more! We visited a farm today in Warrenton, VA and they had their farm's tomatoes on sale that had passed their peak freshness. I saw the bin of beautiful tomatoes and knew that I had to make some of my Mom's tomato soup! Recipe test for Red Truck Rural Bakery! Last week while looking at my Facebook newsfeed I happened upon The Red Truck Bakery's (from Warrenton, VA) post that they were looking for volunteers to test some of their recipes for an upcoming cookbook! It's been literally forever since I sat down to work on my website. It has been a whirlwind! My husband's job gave him big news and a big assignment right at the same time that God put me in a dream position at a non-profit in my area. Prayers are answered and sometimes all at once! My husband, Aaron, has been asking me for months, "When are we going to have a party? When are we going to have people over? Why do we have a yard if we are never going to use it?" Etcetera, etcetera! The Farm at Deer Hollow Renovation in Progress! Follow our family as we begin a new adventure renovating an 1890s Virginia Farmhouse in the countryside.